An ecumenical group gathers every Thursday at 8:00 am (some holidays excepted) for worship with Morning Prayer. The service is based on the ancient order of matins, and includes chant, song, scripture, and prayer. 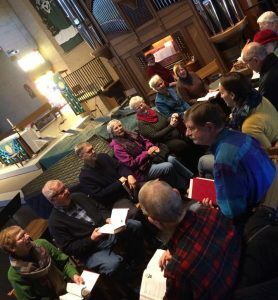 The group boasts members from a number of different congregations across Christian denominations, and the worship is casual and led from within. A time for fellowship, coffee and treats often follows the service. A typical Morning Prayer service lasts about 30 minutes, and is a great way to start your day. All are welcome regardless of faith tradition, church affiliation, or religious denomination.